“There were some gusts, but nothing I could control, except get the ball downfield and giving our guys a chance,” said Collins, who was 17 of 33 for 218 yards with the decisive score. Jarrison Stewart‘s 31-yard catch set up a 4-yard run by Darius Anderson for a 7-0 TCU lead after Isaiah Zuber muffed a punt and Jawuan Johnson recovered at the Kansas State 43-yard line. 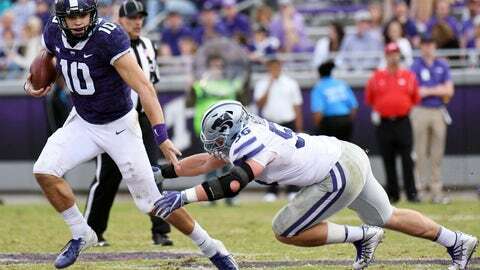 Delton, who hadn’t played in four games, kept Kansas State’s first scoring drive alive by drawing the Frogs offsides on fourth-and-1 on his first snap. Seven plays later, Delton threw to an outstretched Knowles in the back of the end zone. Alex Barnes, the Big 12’s second-leading rusher, gained 76 of his 102 yards in the second half for the Wildcats. Delton was 15 of 25 for 155 yards, and had 36 rushing yards in 23 attempts. Kansas State: The Wildcats dominated the second quarter, but missed a chance for a 26-yard field goal when holder Colby Moore couldn’t handle the snap and threw a pass into the end zone that TCU’s Markell Simmons intercepted. TCU: The road to Patterson’s 16th bowl bid could come down to the final two weeks, if the Horned Frogs don’t win at West Virginia. The Horned Frogs get Baylor at home before going to Oklahoma State. Bowl misses have been rare for Snyder and Patterson. Snyder’s teams have been to 19 bowls in his first 26 seasons, missing only in his first four years (1989-1992), in 2004-05 and in 2009 after a three-year coaching hiatus. TCU’s last season without a bowl was 2013, and Patterson’s only other miss with the Frogs was in 2004.